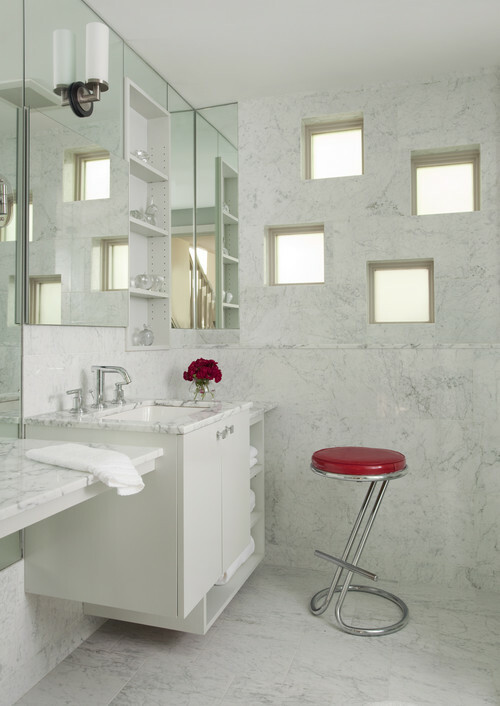 Last week on Whiteout Wednesday I posted five white kitchens accented with red. You all liked the red! 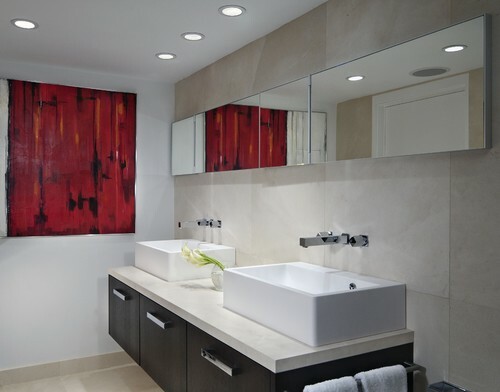 So this week I thouht I'd show five white bathrooms accented with red again. What do you think? 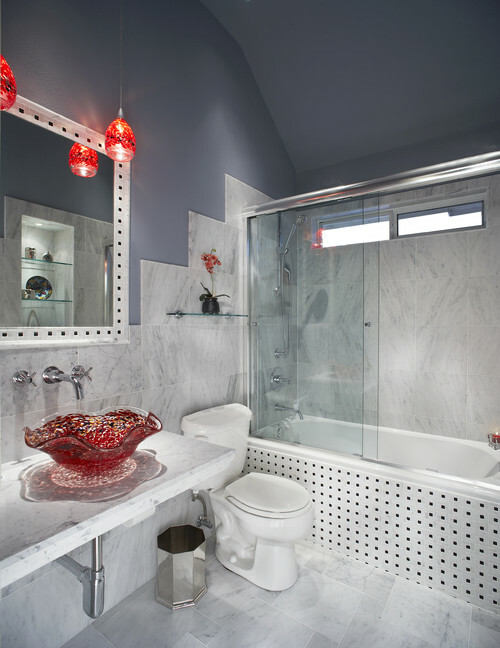 Do you like the red accent in white bathrooms? Be sure to enter this week's Giveaway! Go here to enter. hi, I am building a house and I really like your blog. I have gotten lots of good ideas from you! I am doing impala black granite in my kitchen and I have a question about it, they are saying that because I have a 10 ft island I will need a seam somewhere on the island. Do you think I should shorten my island ( I really need the extra storage space) or are seams in impala black not too noticable? Any help would be appreciated! Andrea - Thanks for the question. A couple of suggestions. 1. Have your fabricator look for a slab that is 120" long or 10'. It is not to uncommon to find something that size. It just takes some searching. Impala Black is a color that you usually can find long sizes. 2. If you can't find a slab that long then a seam is not the end of the world. 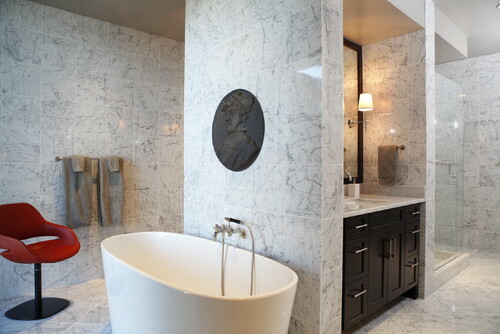 But keep in mind that seams are always more noticeable on darker color and also stones with less veining in them. A lot has to do with how well the seam is done by the installers. But NO installer no matter how good they are can make a seam disappear. Seams are common and part of stone. If you just can't stand them then have your island shortened. If you can then take the seam and keep the extra storage. 3. There is one other potential option. It is complicated and will cost extra. I hesitate to even tell you but you could at least bounce it off your fabricators. Ask them if they can cut the island with a seam but then build it in the shop with steel rods threaded through the island on the underside. THen polish the joint in the shop. So when the island comes out it is all in one piece. THe advantage to this is that if it is polished int he shop where the better tools are then you have a much less noticeable seam than if it is done on site. It is also a risk because it has to be polished just right and blacks are very difficult to surface polish. You just have to check the comfort level of the company you are working with. That is last case scenario. Having said all that, just finding a bigger slab is the best option. If you can't than only you can decide if you can live with less storage space. Thanks for reading. Good luck with the house!